compiled/installed/tuned the latest kernel at the time (2.4.13). It has a 850MHz celery and SiS630 (video/ide/modem/sound/ethernet/pcmcia/firewire). Screen is 14.1" / 1024x768 and quality is quite good. 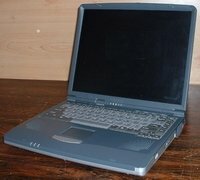 HD = FUJITSU MHN2200AT, DVD = TOSHIBA SD-C2402. and bios upgrades can be got from them. Bad points are it only has a single PCMCIA slot and no serial port. which is changing (see below). Thomas Winischhofer has written excellent support now.